is the most frequently used letter in English, French, Dutch, Spanish, Swedish and German. In English, it has an average letter frequency of 12.072% which means that in a random block of text the letter E will constitute twelve percent of its content. T, its closest rival, bats 9.056. By popularity the alphabet runs: e-t-a-i-o-n-s-h-r-d-l-c-u-m-w-f-g-y-p-b-v-k-j-x-q-z. This order is established by frequency analysis which involves crunching sizable chunks of text and counting how often each letter appears. 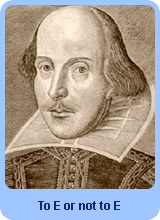 Pasting the “To be or not to be” soliloquy from Shakespeare’s Hamlet into an analysis engine renders a count of 140 Es, 127 Ts, 91 Os, 84 As, 82 Ss, 67 Rs, 64 Ns, etc. At the bottom there are 2 Qs and 2 Zs. No Js. Frequency analysis is important in substitution cipher where a sender tries to disguise a letter by replacing it with another letter. Given sufficient text (the longer the better) E’s doppleganger can be picked out of a crowd simply because it’s out and about more than any other doppleganger. Any way you look at it E is important. While it might rank 15th when it comes to the most common first letter in words (T and S duke it out for this one) it pulls ahead once again as the most common last letter. In 1969 the French writer Georges Perec wrote an entire book without E. He titled it La Disparition (The Disappearance) and amazingly it was translated into English, also minus E. Perec was a word juggler, obsessed with anagrams, palindromes, crosswords, lipograms and other obscure word games. He wrote La Disparition for the hell of it. To show it could be done. He was a very smart Frenchman. I, however, was a very upset eight year old. Let’s go back to Christmas morning in the Jones household. Paul, Mark and I got up early. It was still dark, the living room cold. Trembling with excitement we switched on the lights. And there it was, the present of my dreams--not gift-wrapped because the Joneses didn’t do that--my Mattoy Super Type children’s typewriter. It had real working keys, a roll bar, paper-threader, ruler, the works. I can’t remember what color it was, but it was shiny and bright and the box it came in was impressively large. It was 5am, and I did what all kids do on Christmas morning, I unpacked my present and then ignored it. There was a lot of candy I had to eat. Looking back on it now and applying frequency analysis to subsequent events, I suspect the candy may have had something to do with it. We stuffed ourselves and inspected each other’s gifts. Mark and Paul weren’t impressed with the typewriter, but Mark--yes Mark--took a plunk at the keys. For a ten year old he had big hands...and a nearly mystical ability to break things with a single touch. I remember hearing a noise. Ignorant then of the sound of a typewriter breaking, I was not alarmed. It was a soft sound, a kechink, followed by an absence of a satisfying thunk. At midday, after some real food, but not much of it, I turned the full force of my eight-year old attention to the typewriter. I was hyper on candy and I was ready. Nobel Prize for writing here I come. When an eight year old is given a keyboard the first thing she does is type her name. I loaded the paper, fiddled it into straightness, and then painstakingly plinked out J-u-l-i-BLANK. I tried again, surname this time. J-o-n-BLANK-s. I punched the key a couple more times, but I already knew. Deep down I knew. Mark had broken the E.
It took a while for the magnitude of this catastrophe to sink in (I wouldn’t learn of Perec’s pioneering work with E until thirty years later). Gamely I tried a few sentences. Today is Christmas and I got a typ-BLANK-writ-BLANK-r. Mark brok-BLANK it. Dad stepped in and tried to help. “C is an E in waiting,” he said. “Type C whenever you need E and then go back later and draw a horizontal line in the middle.” Unhappy, I gave it a try. We had chccsc and cakc. Thcn wc clcancd our tccth. I was writing subsitute cypher, and not surprisingly I couldn’t keep it up. No studies have been done of children forced to substitute the most popular letter of their alphabet with its 12th most popular letter, but I suspect if they were neurosis would be found. According to experts as much as forty percent of the brain may be used in processing language. That’s forty billion neurons, twelve percent of which (48,000,000) are devoted to the letter E.
*Sentence is dedicated to Perec.